Summer truffle capellini: tomato/basil/garlic confit - very delish just like last week. So easy to inhale this, especially with all that summer truffle. Paella with Palamós prawns, sea cucumbers and buchot mussels - they always do wonderful paellas here, and the seafood always changes. Tonight we had Palamós prawns again, and though they were a little mushy, the flavors were all there. The heads, of course, were simply awesome. And it seemed fitting that we would have espardenyas. Soooo yummy. Chuleta de Rubia Galega - ah.... the chuleta... I have missed you! Tonight the portion was a little smaller since there ended up with only four of us, but we did a pretty good job in polishing off most of this. The flavors were still incredibly intense, like the aged Comté or Gruyère I love so much. I waited and watched while everyone worked on the tender cuts of meat, and finally I couldn't hold out any longer... and reached out to grab the foot-long bone. If the flavor of the meat was already intense, it should surprise no one that what's left on the bone was just out of this world. We also had some Comté and Brie de Meaux, as well as some pear tart and lemon tart to finish. 2011 Ram's Hill - lots of green apple, white grapes like muscat, a little mineral. Extremely ripe with a very long finish. Yum! 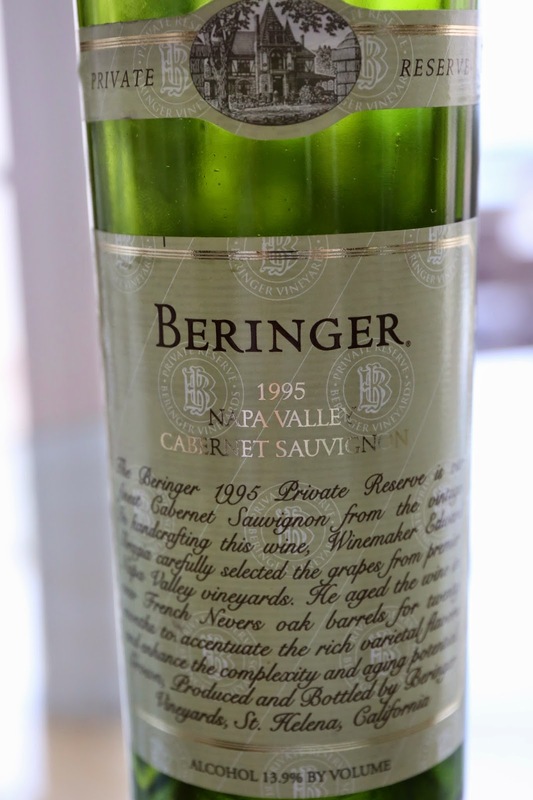 1995 Beringer Cabernet Sauvignon Private Reserve - very fragrant and cedary nose, sweet on the palate, and very full-bodied with some tannins left. Drinking nicely.